"I have hidden your word in my heart that I might not sin against you." Tool: Memory Cross Scripture Memorization Tools - This is an innovative and fun way for people to memorize Scripture. Bible teachers must work toward building a positive attitude toward Scripture memorization in order for teaching for memory to be most effective. 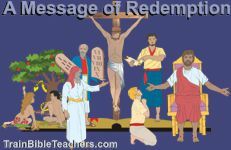 As this six page teacher training worksheet emphasizes, it requires that teachers get beyond their own view toward it or get beyond the way Scripture memory is so often implemented in the classroom. Ten points are considered.